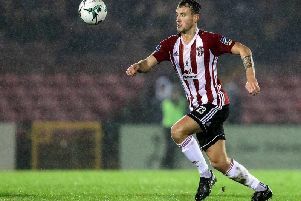 NICKY LOW has called on the Derry City fans to pack out Brandywell Stadium once again tonight and help roar the club into the FAI Cup semi-finals. The Scotsman made a timely return to action following his successful groin operation on Sunday as City lifted a record 11th League Cup with a comfortable 3-1 win over Cobh Ramblers. And while that victory ends a six-year barren spell for the Foylesiders, Low is determined to keep alive the club’s season with a quarter-final victory over in-form Bohemians. Low’s 14 game injury absence has coincided with Derry’s poor run of form in the league and while he admits he’s not yet fully fit, he’s hoping the club can extend their season with another cup run. “We know what’s at stake on Wednesday night,” said the midfielder. “You wouldn’t look past Bohs because you saw what they did to us the last time here two weeks ago. "They’re absolutely flying. They’ve got good players and are just beginning to click now. “It’s going to be a hard game,” he added. “But hopefully the crowd come back out in their numbers on Wednesday and give us a lift. “We’ve been inconsistent this season. When we’re on our game we’re as good as anyone but when we’re bad, we’re really bad. It’s up to us to put that right and it’s a massive week for us so we know what’s at stake here,” he concluded. Storm Ali and the fact it's a midweek fixture could well dampen the enthusiasm for tonight's crunch clash but City boss, Kenny Shiels is hoping the Brandywell Faithful can inspire the players to halt Bohs’ impressive winning run of seven games in all competitions. “It’s going to lift them if they want to play in another final. If we could win on Wednesday, which will be a difficult job, then we’re going to get another environment like Sunday in the semi-finals. “That’s the incentive and motivation for our players. We have another chance to play a big cup game at Brandywell. We’re up against it on Wednesday night but we’ll give everything we have. "They are the best team in the country at the minute," claimed Shiels. "They are better than us at the moment and we are aware of that, but we are trying to work towards getting closer to them."